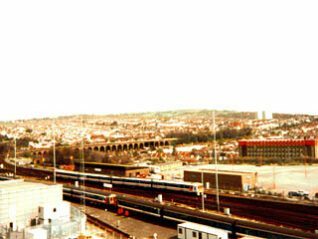 I’ve chosen the picture of Brighton railway viaduct because the grandeur of the viaduct indicates again how the railway was a magnificent piece of engineering. I was only a child during the war but I remember that the German pilot was either an excellent bomb aimer or he was very lucky because one of his bombs sliced straight through one of the spans of the viaduct but with the wartime spirit that was very quickly bridged again. My grandparents, John & Joyce Walker, ran the cafe at 83 Preston Road in the shadow of the Viaduct, from around 1952 to 1957. It was called the FILO (First In, Last Out!) and they served fabulous English lunches – fish & chips with fish bought from the sea front market at dawn that morning, and steak and kidney puddings made by my gran. Grandad’s favourite trick was putting a pile of dirty plates on his head and waltzing through to the kitchen. (They made thier own entertainment in those days…) I dimly remember a story in the Argus that a chunk of the Viaduct fell off on to their forecourt some years after the war – presumably loosened by the bombing. Their grub was so good that it didn’t harm their trade. John & Joyce were great characters, ace ballroom dancers and wonderful life-loving people. After he sold the cafe Grandad worked at Beaconsfield Hardware Stores in Beaconsfield Road, now a postcard shop. Does anyone remember them? John Walker worked at Beaconsfield Hardware where my Sister in law Carol also worked, the owner was called Dennis. My brother Mick delivered pink paraffin in a Bedford CA van for the shop and when I first married he spoke to John about property he owned. John became my landlord at 27 Buckingham Rd for a number of years, I well remember him climbing the stairs to collect the rent and have a cuppa with us. We got a council house around 1974 and moved on as by then we had two small boys all in the one room and kitchen . One of the pillars has a double arch built into it, and has a void/room, you can see the old timbers jutting out of the wall which indicate two more floors. Wonder if anybody knows what this would have originally been used for? The bomb that hit the Preston Road viaduct was in fact lucky to hit the target. Bombs are not always impact bombs, some have timers so they can bury themselves inside a building rather than exploding on a roof or upper floors on in tact. The bomb that took the viaduct pillar out landed near New England Road, the bomb bounced along Campbell Road towards the Argyle Road junction. The bomb then entered house at No.2 Argyle Road through the upper ground floor front window, it then went through the room dividing wall and out the back window. I believe a family were hiding in a Morrison shelter in No.2 at the time. The bomb finally nestled at the bottom of a pillar where it exploded a few seconds later via the timer. The pillar was badly damaged but still in place; the pillar finally came down several minutes later bringing the 2 arches it supported down as well. The Lewes line was up and running in a few days using steel joists to bridge the gap, these were in place while the rebuilding of the pillar was completed. The full repair was completed within a few weeks of the bomb falling.